In Detroit in the long hot summer of 1967, the political winds are burning hot—under Lyndon Johnson, Martin Luther King, Jr., Malcolm X, and the anti-Vietnam war protests. Police brutality against African Americans in the big cities is boiling up and the lid is about to blow off. The season of political uprisings is raging, already, leading up to the Anti-War demonstrations in Chicago in 1968, at the Democratic Convention. 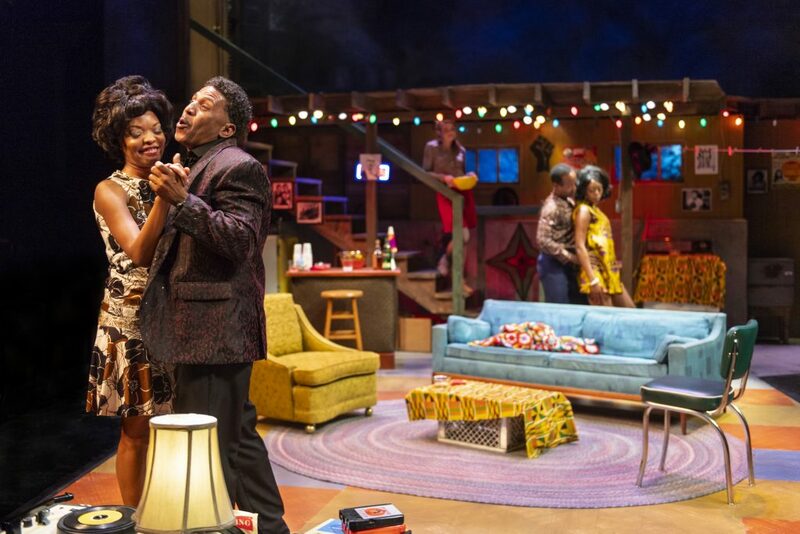 To bring it all forward to us, skillful Director Darryl V. Jones and artful set designer Richard Olmsted have created a down home, convincing rent-party basement for “Detroit ‘67” by Dominique Morisseau. 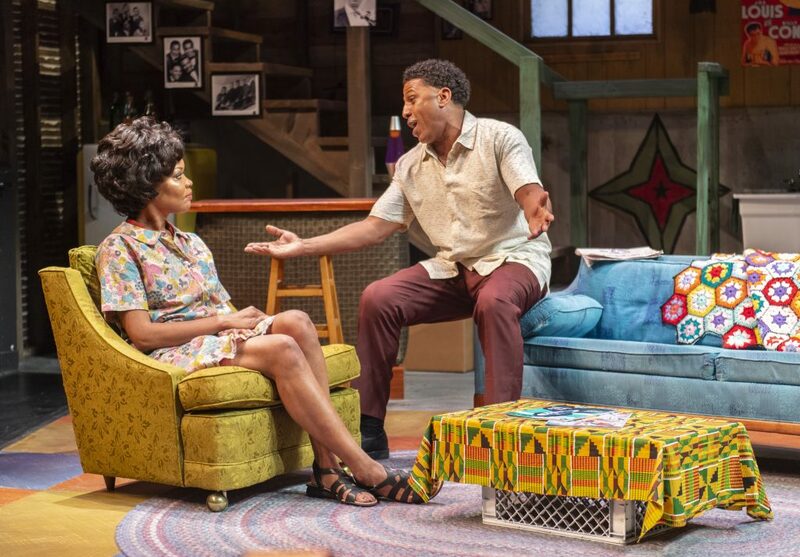 The knotty-pine downstairs with its echoing wooden staircase and Black Power posters—Malcolm, the Black Panthers, Black Power Fist—enhance a familiar family struggle. 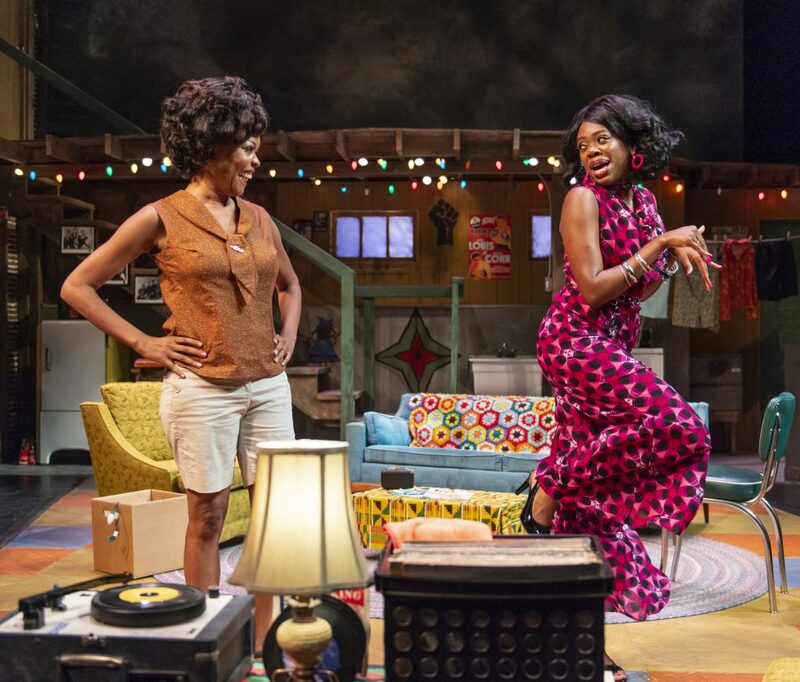 “Detroit ’67” has plenty of talent to make it happen. Older sister Chelle (indomitable, loveable Halili Knox) is hanging Christmas lights, busily turning their 60s basement into a party space to make some money—because Detroit police harass Black folks at their clubs. 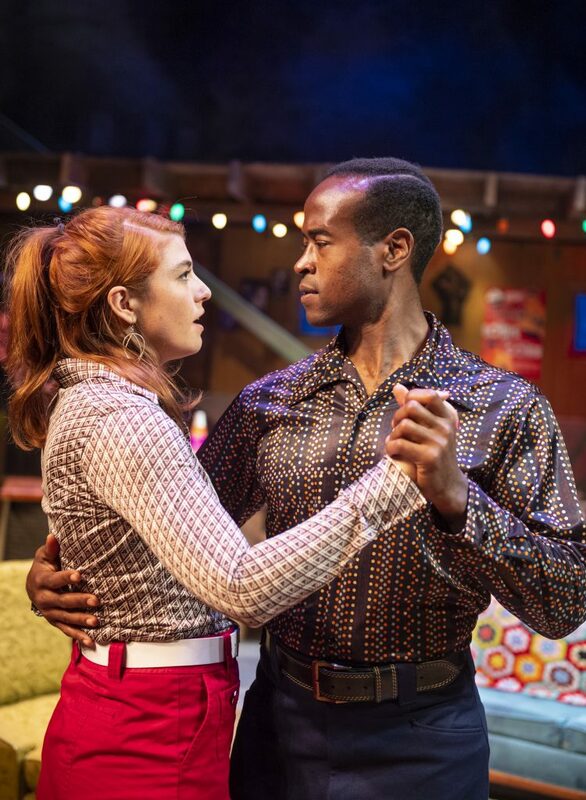 Knox makes Chelle an irresistible force, as she tries to tame her restless younger brother Lank (fascinating, fiery Rafael Jordan). Revolt breaks out while we are enjoying their debate over Chelle’s old 45 record player versus Lank’s spiffy new eight-track. We know in our hearts that smart, practical, powerful Chelle will take care of Lank—for Langston. And we know she will fail, too. Costumes by Kitty Munzel and swift pacing provide special pleasures. Chelle’s friend, lively, sensual Bunny (sprightly Akilah A. Walker) shakes it up in her beige leather mini-skirt or a tight-fitting flowery print. Walker makes Bunny as interesting as Morisseau’s script allows. Lank’s buddy Sly (charming Myers Clark) provides comedy, romance, and dance moves. Sly backs up his bud at every turn, and brings love into the house. 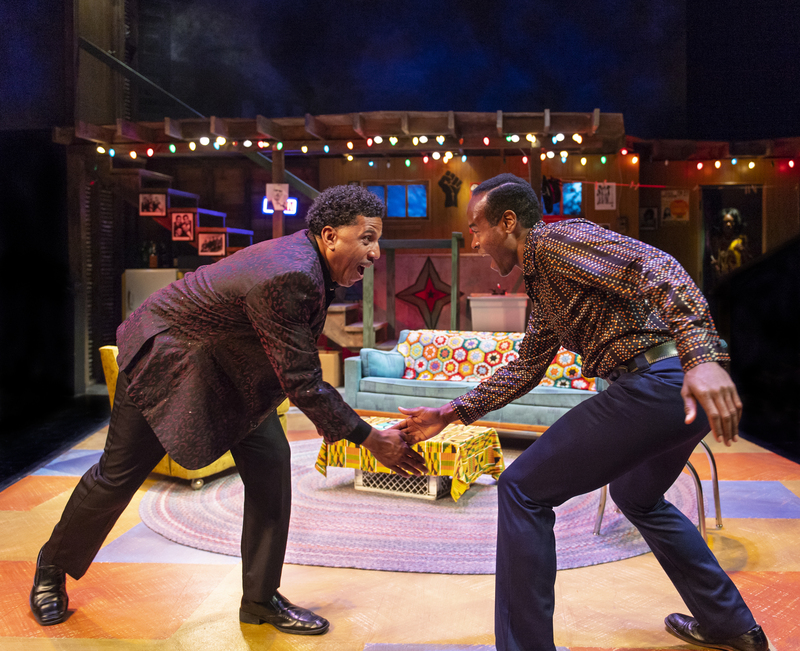 We would like to see more of Sly, too; but the play over-all needs to be trimmed. Fascinating portrayals by all the actors—including an intruding, battered white woman, Caroline (intense Emily Radosovich). Caroline’s love scenes with romantic Lank are touching and endearing, but she remains a pawn. The historical videos do a good job of showing us the horrors of their burning neighborhood, but they remain disconnected from the family struggle. Morisseau depends on familiar family conflicts to reflect huge racial and political earthquakes outside their door. 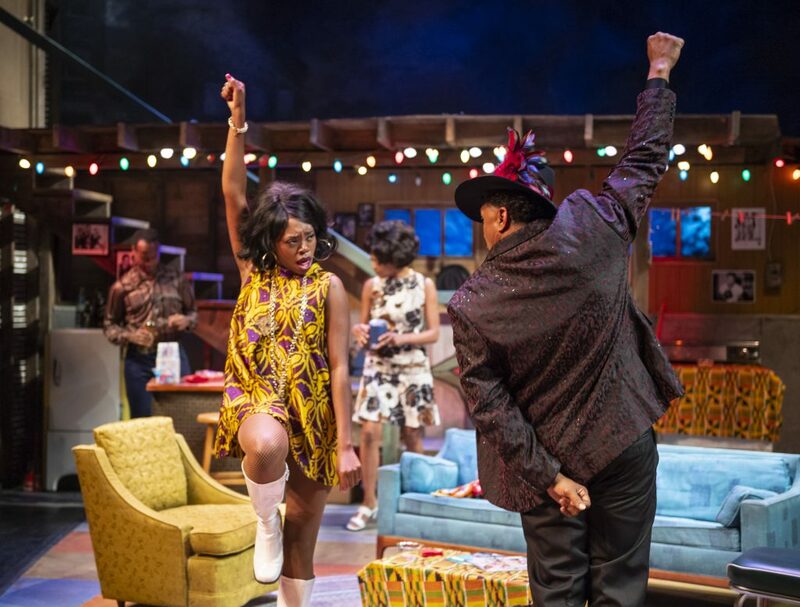 Director Jones artfully makes the script work with his letter perfect cast and crew—plus Motown music and flair. Cast: Myers Clark, Rafael Jordan, Halili Knox, Emily Radosevich, and Akilah A. Walker.